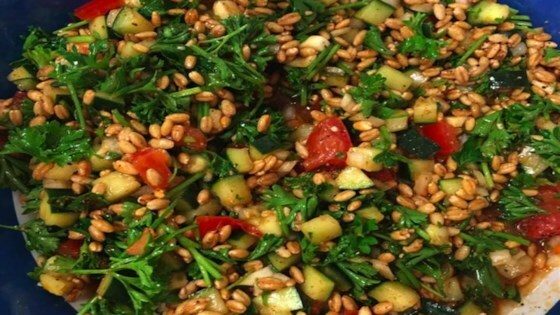 "Per request from every class I have ever made this for, here is a quick tabbouleh for your table. The one advance step is to let grain seeds sit in water on their own overnight before you make it, but that is no big deal. Salad can be made up to 3 days in advance." Place barley in a 1-quart glass jar. Cover with warm water. Let soak at room temperature until doubled in size, 8 hours to overnight. Drain and rinse barley; transfer to a large bowl. Mix cucumbers, tomatoes, onion, parsley, lemon juice, olive oil, paprika, salt, garlic, and black pepper into the barley. You can use wheat berries, whole oat groats, or even mung beans instead of the barley. Substitute avocado oil for the olive oil if desired.